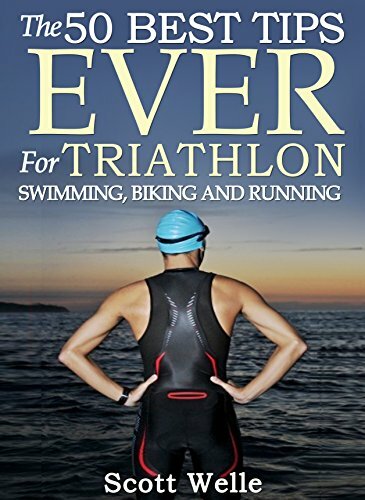 The 50 Best Tips EVER for Triathlon Swimming, Biking and Running is a book by Scott Welle. Welle is a motivational speaker and has completed half a dozen Ironman triathlon as well as ultramarathons and many other events. I took some useful advice away from this book. Welle argues that you should take it really easy up a hill and go as fast as you can down. Typically, you would think of climbing as hard and descending as some recovery time. But he points out that going 10% faster up a hill is not much faster, whereas 10% faster when descending makes a big difference. He also argues that transition is not that important because it is so little of your time overall. It’s not that he suggests you ignore it: he does suggest some planning and rehearsal. But he argues you aren’t going to make big gains here because it’s such a small percentage of your race overall. He shuns all the fancy bike accessories you can buy, except for some wheels and an aero helmet. The only essential you need after buying a good bike is a proper bike fit. And he shuns junk miles: everything should be really easy or really hard. Ideally, some of it should be on grass to be easier on the body. Nutrition wise, he suggests eating 200-300 kcals per hour you will be racing. So, two hours before, take on 400-600 kcals of carbs, no protein, fibre or fat. During exercise, 200-400 kcals per hour depending on your body weight. And for recovery, use a 3:1 or 4:1 ratio of carbs to protein. This entry was posted on Saturday, June 9th, 2018 at 11:00 am and is filed under Books. You can follow any responses to this entry through the RSS 2.0 feed. Both comments and pings are currently closed.